428 pages | 269 B/W Illus. This is the clearest and most straightforward biomechanics textbook currently available. By breaking down the challenging subject of sport and exercise biomechanics into short thematic sections, it enables students to grasp each topic quickly and easily, and provides lecturers with a flexible resource that they can use to support any introductory course on biomechanics. The book contains a wealth of useful features for teaching and learning, including clear definitions of key terms, lots of applied examples, guides to further reading, and revision questions with worked solutions. It has been significantly expanded to encompass rapidly developing areas, such as sports equipment design and modern optoelectronic motion analysis systems, and it includes a number of new sections that further develop the application of biomechanics in sports performance and injury prevention. A new companion website includes a test bank, downloadable illustrations and, where appropriate, suggestions for learning outcomes and/or lab-based sessions for lecturers. 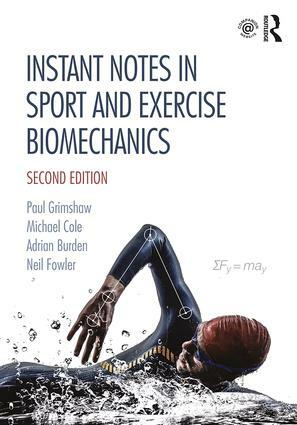 Instant Notes in Sport and Exercise Biomechanics has been an invaluable course companion for thousands of students and lecturers over the last decade. Engaging, direct, and now fully refreshed, it is the only biomechanics textbook you’ll ever need. Paul Grimshaw is Associate Professor in Sports Engineering within the School of Mechanical Engineering at the University of Adelaide, Australia, where he is also Director of Engagement and Bachelor of Engineering (Mechanical and Sports) Program Coordinator. His main research interests are concerned with the prevention of injury in the knee and lower back, especially in golf. Michael Cole isSenior Lecturer in Neuroscience and Motor Control within the School of Exercise Science at the Australian Catholic University, Australia. He has been involved in a number of multi-disciplinary research programs that focus on injury prevention and span the areas of sports biomechanics, clinical biomechanics and neuroscience. His particular areas of expertise are in the assessment of postural instability, gait disability and falls in people with Parkinson’s disease and the evaluation of the invasive and non-invasive therapies for movement disorders. Adrian Burden is Reader in Sport and Exercise Biomechanics in the Department of Sport and Exercise Sciences at Manchester Metropolitan University, UK, and is a Senior Fellow of the Higher Education Academy. He has held workshops on surface electromyography on behalf of the British Association of Sport and Exercise Sciences, and his research interests lie in the application of electromyography in clinical, sport and exercise settings. Neil Fowler is Dean of Students at the University of Salford, UK. Before joining the University of Salford, Neil held the roles of Head of Exercise and Sport Science and Associate Dean of Learning Teaching and Quality Enhancement at Manchester Metropolitan University, UK. His research interests include spinal mechanics and pain management, the energetics of wheelchair propulsion and Paralympic sport, and the biomechanics of jumping.